My research engages the relationship between people, place, stories and time. This manifests in my doctoral work with examinations of human-fish relationships in the context of colonialism in the Western Arctic. But closer to home, in amiskwaciwâskahikan (Edmonton), my work examines people’s relationships to place through story and art — fish stories, land stories, stories of movement and sound and resistance in the face of settler-colonial aesthetics, architecture, planning and design. Revisiting the life’s work of my Dad, Métis artist Garry Todd, now that I am all grown up, is a huge part of my formation as a thinker, writer, scholar and activist. In his paintings, my Dad makes tangible the landscapes, stories and aesthetics of the lands on which he was raised. My Dad taught my sisters and me about these lands through walking-lectures he offered to us as kids growing up in the heart of Edmonton. We walked through ravines and gullies and learned about complex place-based histories. About the ‘re-wilding’ of the river valley, about the places where coal seams were mined and hills now slump over their cavernous carcasses. 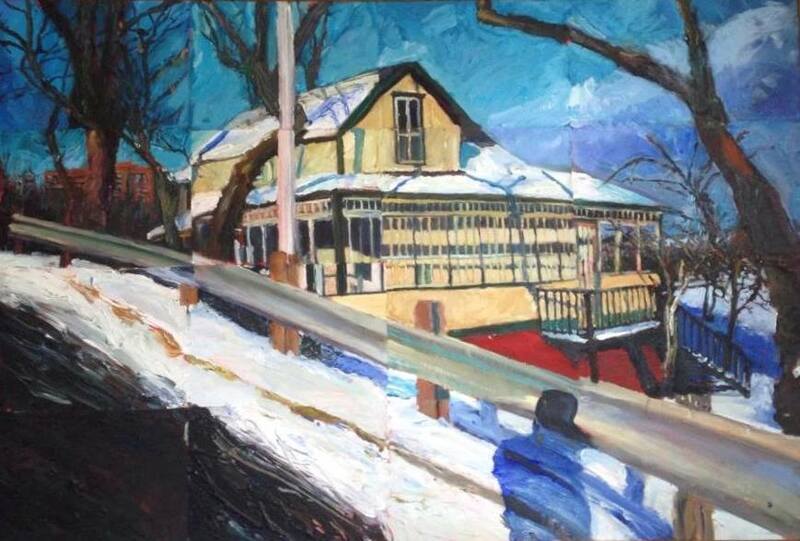 I came to know Edmonton, as a place and an idea, through the intertwined action of my Dad’s stories about the city and through the paintings he made of Edmonton buildings and landscapes when I was a child. I have written about these relationships to place, story and art elsewhere. Painting by Garry Todd, photography by Zoe Todd. Making sense of my relationship to Treaty Six Territory as a Métis woman is a major foundation of my ethical duties as an Indigenous scholar. Without an understanding of who I am and what I owe to my home territory, I cannot position myself ethically in relation to the Indigenous legal orders, stories and laws of the territories I move through, in other aspects of my personal and professional life. In thinking through, and enacting, the principle of ethical relationality that Paspaschase Cree scholar Dwayne Donald outlines in his own philosophical engagements with amiskwaciwâskahikan, I must position myself first and foremost as a citizen with reciprocal duties to Edmonton and its stories through space and time. From this positioning as a citizen-with-duties, I can then imagine and build my ethical engagements with the academy and its operations. This ethical relationality is not just a duty for Indigenous people, but is something that settler Canadians must also engage in. What do the inter-related worlds of research, activism, art and politics look like when centre our roles as citizens with duties to one another (and centre our duties to the land(s) we inhabit)? For these reasons, over the last five years, I have written about relationships to Edmonton as a Métis woman on my blog ‘Urbane Adventurer’. Though this work is not recognized as an ‘official’ scholarly contribution, it deeply informs how I hold myself accountable as a scholar-citizen. The blog, as I see it, is art and work. This blog-work draws heavily on the stories my Dad, Aunties, and cousins have shared with me over the years and also draws on the oral history shared informally with me by my Mom’s family – who are not Indigenous—about Edmonton and their relationships to it. My blog is an ethical action, a public documentation of my reckoning of my duties to others. It is a work-in-progress, deliberately transparent in the presentation of my thinking (and significant shifts in my thinking) over time. My blog is also a space where I can write about my relationship to art—and how art deeply informs my thinking about place, stories, time, duties—without contending with the structures of the academy that still locate, frame and extrude art within narrow Euro-Western discourses and logics. My blog is where I write about art without a BFA or MFA or PhD in art history to verify my knowledge. Instead, Urbane Adventurer is where I write about art as the daughter of an artist, as someone taught to see the world with a painterly eye by her Métis father from a very young age. My blog is where I reclaim my right to be an artist, a right to make art without having to pander to non-Indigenous academic ideals of what art should look like, serve and embody. My blog, is in effect, an ongoing conversation with ideas my Dad planted in my head when I was little. Ideas about who is policed into and out of spaces. Conversations about the land, about the city, about how to be accountable to myself and to others. My blog is an ongoing reckoning of my duties to the ways my Indigenous family members were viewed, treated, and imagined within Edmonton in the past. My blog is where I right the wrongs of discrimination and dismissal I witnessed my family members experience when I was just a small child. My blog is where I imagine futures where those violent pasts are addressed, corrected, subverted. The Euro-Western academy demands that we position it as our primary interlocutor. My work outside the academy, through my social media and blog outputs, is an attempt to position land, kin, and stories as my primary interlocutors. I have elsewhere written about my relationship to Edmonton and the way its stories are told in specific ways through gentrification processes that erase and obscure the presence of Indigenous stories, art, and laws in the city. Though my Dad has taken as his subject many different themes—from landscapes to cargo ships to horses to Edward Curtis paintings—it is perhaps the paintings he made of what were iconic Edmonton buildings, to me, as a child, that loom the largest in my mind. These buildings have long since changed (many of them torn down to make way for new developments). But in my mind, I imagine myself conversing with those paintings—with the fleeting moments they represent. The light and colour they capture, the effort of the brush strokes, the long-since gentrified studio they were painted in. Dwayne Donald  evokes the notion of pentimento in his writing about Edmonton. My blog is a form of relational pentimento—my Dad’s paintings show through in my words. My words are an homage to the work my Dad painted in his studio, a conversation started twenty-five years ago in the basement of an inner city warehouse studio now converted into high end condos. And this is where I position myself: as a third-generation urban Métis scholar-writer-artist intent on giving back to the land and stories who have given me so much. Zoe Todd (Métis) is from Amiskwaciwâskahikan (Edmonton) in the Treaty Six Area of Alberta, Canada. She writes about Indigeneity, art, architecture, decolonization and healing in urban contexts. She also studies human-animal relations, colonialism and environmental change in northern Canada. She is a Lecturer in Anthropology at Carleton University. She is finishing her PhD in Social Anthropology at the University of Aberdeen, Scotland. Zoe Todd and Daniel Morley Johnston, “Cities Are Our Camps: relationship, reciprocity, and urban land-based pedagogy,” Urbane Adventurer Blog (2014). Retrieved from https://zoeandthecity.wordpress.com/2014/10/17/cities-are-our-camps-relationship-reciprocity-and-urban-land-based-pedagogy-post-review-redux; Todd, “Indigenizing the Anthropocene,” in Art in the Anthropocene: Encounters Among Aesthetics, Politics, Environment and Epistemology, edited by Heather Davis and Etienne Turpin (Open Humanities Press, 2015), 241-254. Dwayne Donald, “Forts, Curriculum, and Indigenous Metissage: Imagining Decolonization of Aboriginal-Canadian Relations in Educational Contexts,” First Nations Perspectives 2, 1 (2009), 1-24. Pingback: Whose ‘Ribbon of Green’?